In the first meeting between Solomon Islands and Fiji since the Pacific Mini Games in Vanuatu last December little has changed with the two sides once again drawing even with a 1-1 draw during last night’s international friendly at ANZ Stadium in Suva. Solomon Islands opened the scoring in the 23rd minute through a fine finish from Manukau United striker Micah Lea’alafa. The visitors managed to hold onto that lead throughout the first half of a tight contest, and continued that dominance into the opening 15 minutes of the second half. However the hosts then got a break when Solomon Islands captain Benji Totori fouled Dave Radrigai in the penalty area which had New Zealand referee Nick Waldron pointing to the spot. 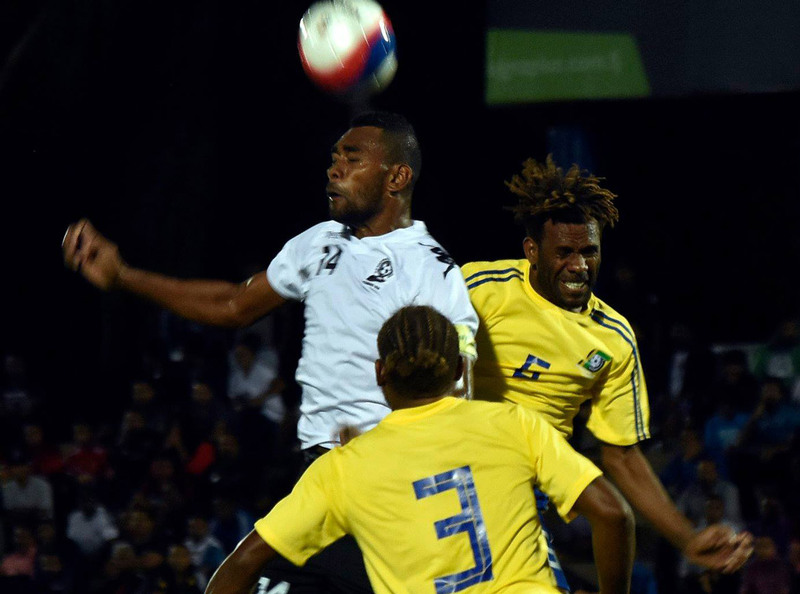 Fiji captain Roy Krishna stepped up and fired past Solomon Islands keeper Phillip Mango to bring his side back in line. Fiji coach Christophe Games said given the short space of time the team had been together he was pleased to be able to come away from the match with a draw. “We had a lot of opportunities in the game but our players were not able to take advantage of them,” Gamel said. For Krishna the momentum was missing from the outset and after the early goal from Lea’alafa his side were on the backfoot. “We need to play structural football like every other team,” Krishna stated. The match was also an opportunity for England-based Scott Wara to make his debut for his birth nation, which he did as a substitute, coming on just ahead of the half time break. The midfielder said it was a great feeling to finally represent Fiji, however believes more time is needed to find his feet in the squad. “I plated in a new position for me today and I feel overall the team could have done better against the Solomons,” Wara said. Solomon Islands coach Moses Toata thought his player executed the game plan well. “We had a game plan to use our counter attacking when we win the ball,” he said. “So I started the game with Benji (Totori), Alwin (Hou), Joses (Nawo), Micah (Lea’alafa) and Atkin (Kaua) leaving a block at the back. We isolated Roy Krishna with Manu man-marking him. Toata added that his team did well in dealing with Fiji’s aerial threat despite conceding a soft goal. “Their penalty came from a scrappy clearance from a corner and Philip Mango dropped the ball that Benji tried to clear resulting in the penalty. “Generally the boys did well to contain their aerial play especially when they have taller players. “But personally, I think from the chances we had we still could have finished the game with a win,” he concluded. Fiji will now head into camp in Ba before travelling to Singapore on Saturday to play its second international friendly of the current FIFA window next week.